One demonstrator held a placard addressed to the electoral commission chairperson, Rita Makarau, July 12, 2017. The sign said, “Makarau, we demand a fair election 2018! !” Police descended on the protester and forced him into their vehicle. Zimbabwean police Wednesday clashed with hundreds of opposition protesters calling for electoral reforms before next year's polls. Zimbabwe’s capital city came to a standstill for about four hours Wednesday as opposition protesters conducted running battles with police. Police used tear gas and water cannons to disperse the demonstrators, who were lobbing stones and even pieces of fruit they grabbed from street vendors. Heavy police presence did not deter opposition protesters in Harare, Zimbabwe's capital, July 12, 2017. Police said the protest had not been sanctioned, as required by law. VOA saw police kick or beat at least 20 protesters with batons before arresting them. Police said the protest had not been sanctioned, as required by law. Police descended on the protester holding the sign, Ralf Dzenga, and forced him into their vehicle. VOA spoke to him before his arrest. The opposition says as many 100 people were arrested and 25 more were injured. VOA could not independently verify that count with police. The opposition called for the protest after the Zimbabwe Electoral Commission said it would not allow citizens living outside the southern African nation or those without proof of residence to take part in elections, expected between July and August of next year. 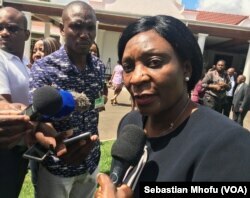 Zimbabwe Electoral Commission chairperson, Rita Makarau says, July 12, 2017, the country’s parliament must change laws otherwise her organization cannot allow citizens in the diaspora to vote next year. On Wednesday, Makarau maintained her organization, also known as ZEC, was not to blame for the decision. In the past, the opposition in Zimbabwe has accused the country’s electoral commission of favoring the ruling ZANU-PF party. Earlier this year, it took to the streets calling for the commission to be disbanded. President Robert Mugabe, who says he will stand for re-election next year at the age of 94, has scoffed at claims the electoral commission favors him. Mugabe is currently in Singapore for medical reasons.